Hey, Dolls! First off, Happy Monday, and second, congrats to Spain on their World Cup win! Now on to business! We've been experiencing quite the heat wave here in the Northeast this past week, so we graciously accept Hillary's newest post on summer office attire. Have you seen some women in your office wearing grossly inappropriate items?! Don't be one of them! Read Hillary's summer style tips below to make sure you are looking professional even on the hottest of days! 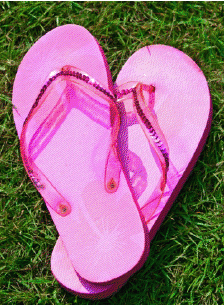 Wear flip-flops to the office. In addition to the sometimes obnoxious noise that accompanies wearing this summer favorite, many office environments frown upon this casual footwear. Though it might be tempting to slip on the flips, leave these shoes for the sand, or at least hide them under your desk or in your purse (only if they are clean, please!) for after work! 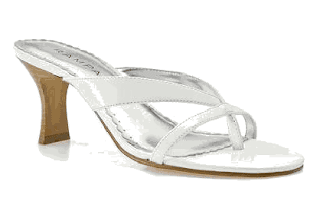 Wear professional or dressy sandals - if your office allows open-toed shoes. The above Rampage Madyson Patent Sandal, available at DSW, has a comfortable low heel and also allows you to flaunt your pedicure. Wear shorts. Though the above shorts may look slightly dressy with a belt and heels, there is no hiding that showing too much skin in the office can make you look unprofessional. Consider wearing longer shorts, like the above Drew Double Button City Short from The Limited. This crisp look has a dressy tone, and just coming over your knees this pair won’t be too showy for the office. Wear a see through sundress. Though Lauren Conrad’s white sundress is cute and light for those heat waves, it’s clear she’s outside enjoying “The Hills” and isn't in the office. 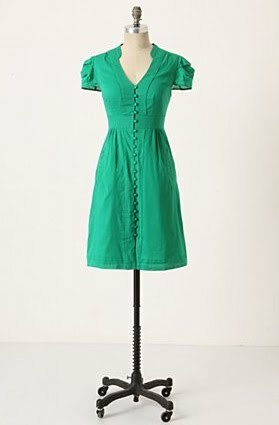 Consider wearing a bright colored dress to summer it up, like this Secret Treasure Dress from Anthropologie. Or, should you really be set on wearing one of your more summery strapless dresses, make it office-appropriate by wearing a cardigan to cover up and fight those freezing office temperatures. Wear spaghetti strap tank tops (like the above from American Apparel) unless it's worn as an under shirt (or unless your office is a dance studio). Regardless of what season it is, staying away from showing too much skin in the office is key to looking professional! Know it's ok to wear a conservative tank. If you feel the urge to go sleeveless, consider wearing a tasteful top like this Cowl Neck Top from The Limited. We find it amazing how many people, on a daily basis, we see breaking these simple rules. Thanks, Hillary, for bringing us these much needed tips!